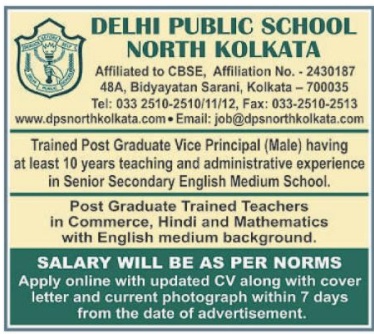 DPS, North Kolkata has advertised in Telegraph newspaper for the recruitment of TGT plus PGT jobs vacancies. Interested and eligible job aspirants are requested to apply with in 7 days. Check out further more details below. About School: DPS NORTH Kolkata over the years has burgeoned into an institution of excellence with approximately 2800 students, excellent faculty members to foster independent thinking, creativity, responsibility and a strong sense of moral integrity along with the supporting staff paving its way today to stand tall and proud to meet the challenges of the ever changing global society. It has classes from pre nursery to class IX and is affiliated to CBSE, New Delhi.